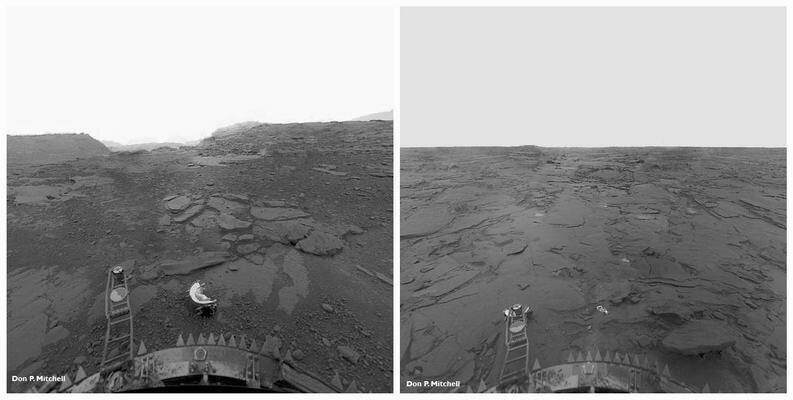 The surface of Venus, as seen from the Venera 13 lander. The debris at the front is part of the lens cap. It is hell up there. No man-made object has ever survived the immense heat and pressure for more than a few hours. Each day lasts 117 earth days, but the Sun never appears. The yellow clouds which hide the Sun contain sulfuric acid, but down at the surface the air is not corrosive, just boiling, and 100 times thicker than on Earth, only ten times less dense than water. Walking would be hard: it would be like wading through ankle deep water, and even a breeze would knock you off your feet. Welcome to our twin sister, more like us than any other planet we know. There are only two major differences between Earth and Venus: Venus hardly rotates, and it has no water. That is all it took to turn heaven into hell. Venus is almost the same size as the Earth, and probably has the same composition and internal structure; by all planetary measures this is our closest sibling. To give some numbers: Venus has a radius of 6052 km, whilst Earth has 6371 km (Mars has a measly 2440 km, not much more than the Moon). Gravity at the surface is only 10% less than on Earth. The surface of Venus remained completely unknown, hidden from us by the perpetual cover of dense clouds, leaving everything to the imagination. Being closer to the Sun, Venus was expected to be warmer than Earth, but to astronomers from cold European climates that sounded like a good thing. Early science fiction writers imagined Venus as a tropical paradise. Their imagination was far wrong. Now we know that the clouds hide an out-of-control greenhouse, where temperatures reach 460 C (or over 800 F). The atmosphere is 92 times denser than ours, and 97% of it is CO2. Once, the Earth had a very similar atmosphere, shortly after it formed. But here the CO2 was quickly removed by the oceans, turned into carbonates and carried down into the mantle by subduction. This did not happen on Venus. For the first few hundred million years, there was still water and there may have been a planet-wide ocean – a true Perelandra. But temperatures became too high: the oceans dried up, the water was lost to space, and CO2 ruled with a vengeance. Now Venus is boiling hot and oven-dry, underneath a blanket of sulfuric acid, a hell worthy of Dante. A planet of love gone sour. Mars seemed the more glamorous target and NASA paid little attention to Venus. Exploration of Venus was mostly done by the Soviet Union, who send out satellites beginning as early as 1970 and even carried out a number of landings on Venus. Their impressive Venus program was sadly curtailed by the collapse of the Soviet Union. There have been no landings since 1985. During the program we received images of the surface, X-ray data on the soil and even one soil sample was analysed. All experiments had to be done in a rush: the extreme pressure and heat destroyed all landers within hours. Venus was the crowning glory of the Soviet space program. But if only we could have had a Curiosity-type rover on Venus! NASA did send one radar satellite mission, Magellan, which superseded earlier Soviet mappings. The radar could peek through the cloud and measure the height of the surface below. It found a largely flat planet, but with some lowlands, some mountainous highlands, some impact craters, and volcanoes approaching the giants of Mars in size if not height. Two third of the surface of Venus is a flat to undulating plain, with elevation differences of less than 2 kilometer; most locations have elevations within 500 meter of the average radius of the planet. Lowlands, 2-3 kilometer below the plains, cover 30%, and mountain highlands, as high as 10 kilometer above the plain, cover a measly 5%. There are two main highlands: Ishtar Terra in the north, at 3000 kilometer across roughly the size of Australia, and Aphrodite Terre near the equator, roughly the size of Africa. Ishtar Terra contains an elevated plateau, 4 kilometer high, resembling Tibet, and surrounded by linear mountain belts which include Maxwell Montes, Venus’ highest mountain. The maps showed no evidence for plate tectonics. No mountain chains, no ocean basins and trenches, nor continents. For some reason, mantle convection doesn’t have the same effect as it does on Earth. 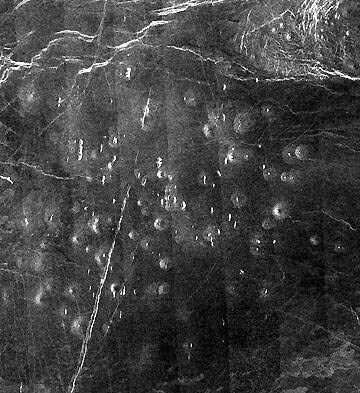 Tesserae are unique to Venus, and were seen in the earliest radar images. They are rough surfaces, standing above the surrounding surface. The composition is unknown; the surrounding areas are volcanic fields. Tesserae are highly fractured, showing evidence for strong tectonic activity. Tesserae are often connected to mountain belts: linear belts, with parallel ridges typically 100 kilometer long, which appear to have formed from horizontal compression. The highest mountain, Maxwell Montes, stands 11 km above the mean height (say ‘sea level’). Above a certain altitude, all mountains become very bright to radar. This may be a temperature effect: at higher levels where temperatures are lower some metal may deposit from the atmosphere, as a metallic ‘snow’ cover or metal ‘ice’ cap. Some mountains become radar dark again at higher altitudes. Lineated plains are up to 100 km across and stand a few hundred meters above the surrounding plains. The lineaments are roughly parallel, 20-30 kilometer long but less than a few hundred meter wide. When in contact with a tessera, they seem to partly cover the tessera material and may therefore be younger. They are probably basaltic, with a volcanic origin. Tectonics, not involving drifting plates, is alive and kicking on Venus. Beta Regio is a particularly good example: an uplift with a central rift valley 1-2 kilometer deep which has three arms. It is a clear case of a continental rift and a triple point; little imagination is needed to envisage a mantle plume below. It shows that rifting can happen even when drifting does not (even on Earth rifts don’t always split plates). The Beta Regio contains two large shield volcanoes, Theia Mons and Rhea Mons, each about 4 kilometer high. The main rift is the Devana Chasm which crosses the summits. The Devana Chasm shows extension by at least 20%: this is shown by distortions in a large crater which it crosses. Three other regions have similar rift zones. Veneras 9 and 10 landed close to Theia Mons in 1975, just east of Beta Regio. Experiments on the lander showed that the surface here has a composition similar to mafic rocks on Earth, and is crushable and porous. 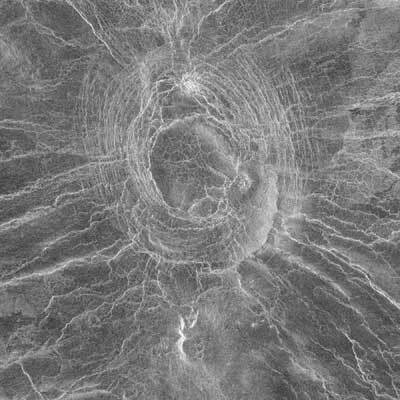 There are about 1000 identified impact craters on Venus. The largest is Mead, with a diameter of 280 km, similar in size to the largest one on Earth, Vredefort. All known craters are large: Venus does not do small craters. This is understandable, as small meteors quickly burn up in the dense atmospheric soup, and only large rocks survive to make it to the surface – large rocks make large craters. (Similarly, but less extreme, the Earth has no microcraters whilst the Moon does.) The smallest Venusian crater is 3km in diameter. This indicates that space rocks smaller than 50 meter burn up. Craters less than 30 km diameter are usually irregular or multiple, formed by an impactor which shattered on the way down but did not burn up. There are some marks on the surface which seem to have come from atmospheric explosions and debris, from space rocks which failed to reach the surface – the Tunguskas of Venus. Some impact craters are surrounded by flow fields, in a volcanic-like appearance. The picture shows such an impact crater, with a flow extending a considerable distance. This is not lava from the interior but surface melt from the impact which flowed downhill, only very slowly solidifying under the extreme ambient temperature. 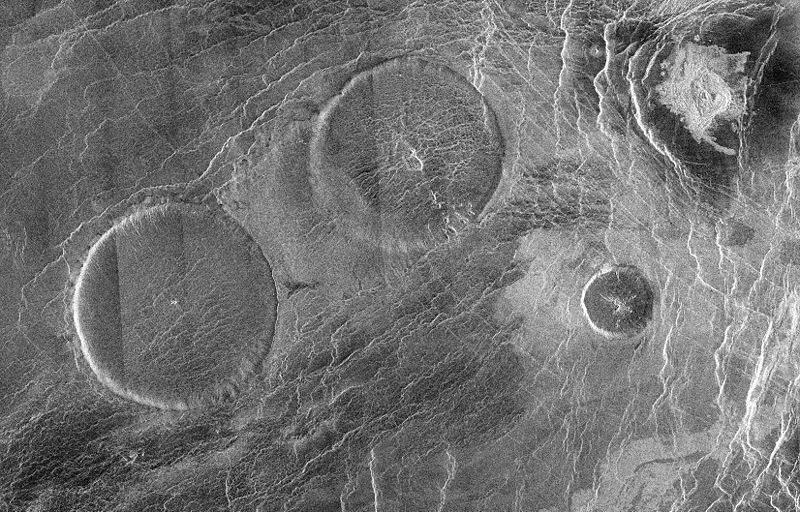 Venus has fewer large craters than had been expected. Over the life time of Venus many more large impacts should have occurred, and the lack of water means little erosion and no sedimentation, so that the craters remain visible. The lack of such craters means that surface of Venus is younger than the planet. Estimates based on the number of craters puts it at between half and 1 billion year. Craters are distributed randomly across the surface. This is different from Earth, where craters are mostly found on the oldest surfaces (such as the Baltic shield). On Venus, crater numbers indicate that all surfaces have a similar age. Very few craters show any indications for partial burying from later lava flows. To reconcile these observations, it has been proposed that Venus was almost entirely resurfaced half to one billion year ago, and that the surface has been left relatively untouched since. A bit like getting new carpets in the entire house and not replacing any for the next hundred years! The re-carpeting can only have been done by volcanoes, with lava flows hundreds of meters or even kilometers thick. Clearly, when volcanoes get going on Venus, they are far more catastrophic than on Earth. Think Deccan Traps, but covering the entire planet instead of ‘only’ a quarter of India. All of Venus? No – like Gaul, small villages held out. The tesserae are thought to be bits of this older terrain, keeping their heads just above the flooding romans lava. Over 1000 volcanic regions were identified in the radar images. The planet of love turned out to be highly volcanic – but its volcanism is sometimes very different from Earth. Much of that has to do with the different atmosphere. To get an explosive eruption on Earth, the gas content of the magma needs to be about 0.07% by mass; the gas is mostly water vapour. On Venus, where air pressure is so much higher, magma needs a larger fraction of gas, of about 3% by mass, to explode. But Venus lacks water, and only CO2 can provide gas. How much CO2 is there in the crust and mantle? On Earth, it was deposited on the ocean floor as carbonate, a process that requires water, and carried into the mantle by subduction. Venus had neither oceans nor subduction. So the CO2 may never have entered much into the planet. It is therefore probable the magma is gas poor compared to Earth. Explosive eruptions on Venus are unlikely: there is a strong expectation that all eruptions are effusive. Once the magma erupts and is re-branded as lava, it will flow. As on Earth, the flow is downhill, and will continue for as long as the lava takes to cool and solidify. The speed depends on viscosity and gravity, both similar to Earth. But the air is much hotter and that has two effects. First, the heat of the lava does not drive strong convection in the atmosphere, therefore no secondary (co-ignimbrite) eruption columns – ash stays close to the eruption and does not blanket large areas. Second, the lava cools much more slowly and therefore will flow for much longer and extend further than on Earth. 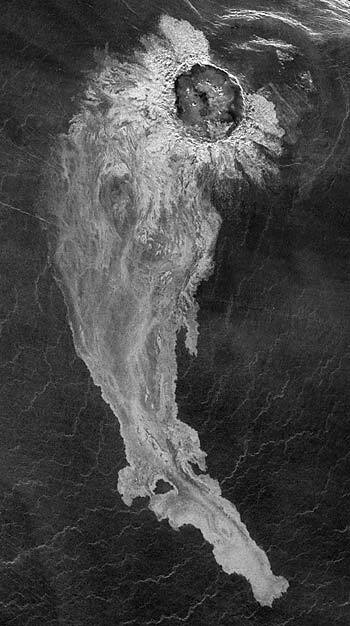 This is clearly seen in the radar picture of Addams crater, above. On Earth such surface melt would have solidified very quickly, and remain in the crater. On Venus, it had time to spread far and beyond. 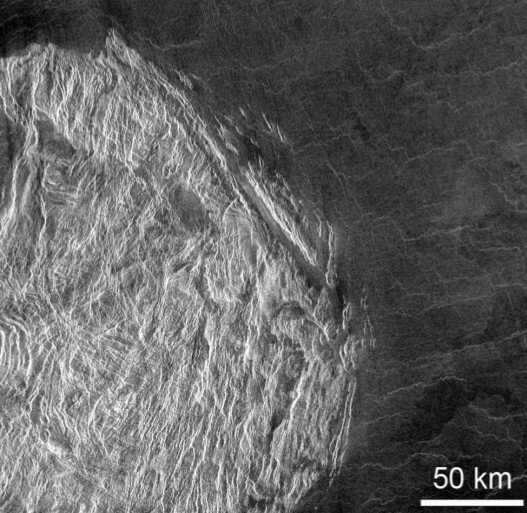 Many of the over 100,000 individual volcanoes on Venus are shield volcanoes, ranging in size from tiny to over 700 km across, and in height from small to 5.5 km above the base level. The heights are not excessive, compared to Mauna Kea’s 9km and Olympus Mons’ 22 km, but the diameters are immense, for instance compared to Mauna Loa’s 120 km. This gives a typical slope of a large Venusian shield volcano of only 1 degree. The lava is clearly very fluid, probably basaltic. Again, the hot atmosphere may explain the extreme size and shallow slope: lava will flow for a long time before solidifying. The largest shield volcano is Theia Mons, in the Beta region. It has a caldera of 70 km by 50 km; the deepest point is 3 km below the peak. As Venusian calderas are probably not explosive, they must have formed by collapse, caused by the emptying of the magma chamber underneath. There are also many small shield volcanoes, occurring in groups. These may be similar to the monogenetic fields on Earth, where each lava outlet only erupts once, after which a different conduit develops nearby. Typical size for a field of shields is 100-200 km, and there can be tens of shield volcanoes in each field. 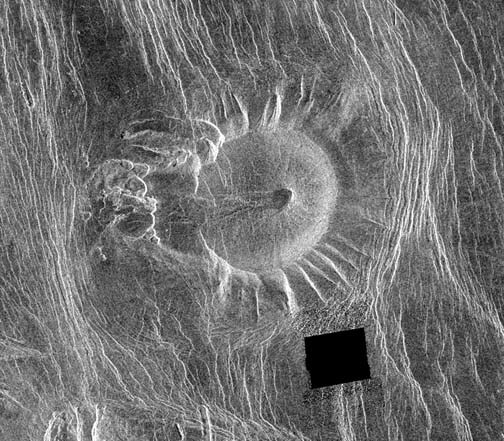 A strange type of shield volcano, found on Venus, are the so-called pancake domes. As the name implies, they are flat or slightly convex, round, raised, a bit like a round version of the Deccan Traps. They stand less than 1 km above the plains, and typical diameters are 20-30km although some are considerably larger. At the centre there may be a small depression, clearly related to where the lava was erupted but embarrassingly small compared to the size of the dome: the depression probably formed from loss of pressure in the central conduit after the final eruption. The pancakes were formed by high volume, effusive eruptions; the steep sides suggest viscous lavas, perhaps rhyolitic which on earth would have erupted explosively. Some pancakes have lava flows coming out on the side, spilling over the surrounding plains: these are called ticks. Three pancake domes. Note the small central holes. The image is roughly 200 km. A type of volcano not found on Earth, coronae are large, circular or oval, raised rings, with a depression at the centre, surrounded by concentric fractures, superficially resembling an impact crater. Most are 100-200 km across but they can be several times larger. The interior often has volcanic features, such as calderas or shields. Coronae are thought to arise from mantle plumes which push up an area; once the plume cools the interior deflates again. Sometimes the corona is surrounded by web-like fractures or dykes, in which case it is called an arachnoid. A 50 km arachnoid would not be for the squeamish, but then, this is Venus. The extreme temperature has another consequence. On Earth, lava travels long distances in lava tubes: the top of the lava cools and crusts over, insulating the liquid below. On Venus, the hot air limits the cooling and the lava flows do not crust over and do not need tubes. The result is spectacular. Radar images have revealed long channels, resembling rivers. They don’t have tributaries, but do show deltas, levees and braiding, and sometimes abandoned bends. The channels can be 1-2 km wide, and extend for many hundred kilometer – and that is a small one. The longest one is 6800 km (yes, you read that right). The extremely long flows must have taken weeks to reach their size. How could they not have solidified? It has been suggested that they contained carbonitite lava, for which the melting temperature is only 50 C above the surface temperature. Alternatively, the channels may have contained sulfur, which is a red liquid under conditions on the surface of Venus. A third possibility, albeit one which I could not find in the literature, is that after the resurfacing, the temperature of Venus was considerably higher than now – a greenhouse on fire. The atmospheric pressure corresponds to that found on Earth underneath 300 meter of rock. The temperature is even more extreme. The surface temperature is what is found on Earth at a depth of 15 km! The crust in Venus is therefore a little more pressured and a lot hotter than that of Earth, to a depth of tens of kilometer. A quick calculation is shown in the figure below, where I assumed that the top of the mantle is at 1400 C.
Under these conditions, no major melt will occur as the temperature at every depth is below the solidus. But without plate tectonics, the crust is a very effective insulator. The heat transported up in the mantle can’t diffuse out as quickly as it generated inside the planet. On Earth, much of the mantle heat leaks out through the thin oceanic crust, which Venus does not have. Heat collects, and the top of the mantle slowly warms up. Eventually it reaches 1500 C, and as the dashed line shows, melting will now begin, around 130 km down. The heating up takes between 500 million and one billion year. As this happens everywhere, a planet-wide molten layer will develop, which is hard to keep down. The magma breaks through, and a deep layer of new lava covers much of the surface of the planet. The mantle loses its excess heat this way, temperatures drop, the magma re-solidifies and Venus goes to sleep. Until, a billion year later, the cycle repeats. This process explains many of the features of Venus. The extensive plains are from the most recent resurfacing – this also explains why it is the planet is so uniformly flat. Some older terrain still peaks out above the kilometer-thick lava blanket, especially the tesserae. The coronae may date from after the last event. The long lava channels may date from the end of the resurfacing. This much we knew about Venusian volcanism: it was extensive, with many volcanoes of unusual types, and once every billion years it would resurface the planet. But the world changed in 2015. The strongest clue that volcanic activity is still continuing comes from the sulfuric acid clouds in the atmosphere. Sulfuric acid is not fully stable in the atmosphere under Venus’ conditions, and it would disappear from the atmosphere over some 50 million years. The only viable source to replenish it is from volcanoes. The Venus Express of the European Space Agency, which mapped the surface of the planet from 2006 to 2014, found three regions with warmer temperatures: Imdr, Themis, and Dione Regiones. These are similar to Hawaii: elevated, with gravitational anomalies indicative of mantle plumes. The same areas have remarkably smooth, young looking lava flows estimated to be no older than 2 million years, and possibly much younger. This was suggestive, but more was to come. A sharp spike in sulfur dioxide in the atmosphere was seen in 2007, followed by a 5-year decline. Had something happened? It could have been purely atmospheric, but could there have been an eruption in 2006/2007? We’ll never know. But the discussion about possible live activity was settled with a paper which appeared in 2015. It reported that on four occasions, the Venus Express found hotspots on the surface which had not been there a few days before. All were in the Ganiki Chasma rift zone, close to the volcanoes Ozza Mons and Maat Mons. One such spot seen on June 24 2008, but had been absent two days before. One of the four areas was less than 1 km2 in size. All indications are that these were volcanic eruptions. This makes Venus the fourth body in the Solar System where active eruptions have been observed, and only the second planet. (The others are Earth, and the moons Io and Enceladus.) Let there be lava. So it appears that the cycle of planet-wide eruptions followed by a billion year of calm is not the full story. There is activity in the rifts during the quiet years between resurfacing epochs. And not just a little: this one area, the most active on Venus, has had at least four eruptions over an 8-year period. Venus and Earth show us that near-identical planets need not be alike. Venus, once thought a tropical paradise, a planet of love, is, in all its seemingly similarity to Earth, a burning hell beyond belief. It took a different path, lost its water, and voted for Vexit. Now, having lost its place among the civilised planets, even our geology doesn’t work there, and Venusian volcanoes, driven by the same physics as Earth, are nothing like ours: rifts don’t rift, cool spots don’t subduct, and volcanoes can suddenly replaster the entire planet. NASA, on the look-out for Earth number 2, should be warned. An Earth-like planet may be nothing like Earth. But its volcanoes will be out of this world. ← Hekla Ready to Erupt? Ah, a nice one, and with an appropriately different taste (read as other-worldly). Thanks! Great article, as usual. Thanks Albert. Why are there no Coronae volcanoes on earth? What is unique about Venus that allows these to form, where Earth cannot form them? 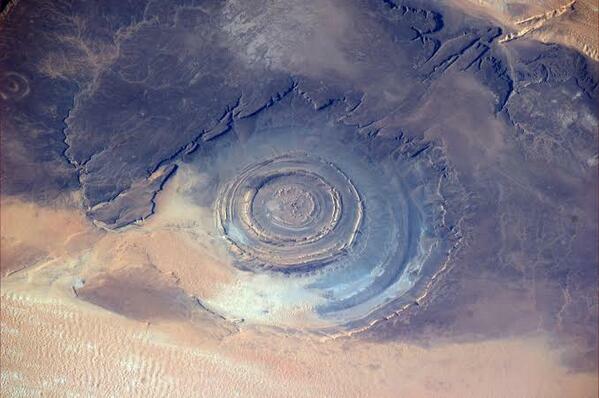 Also, on that note, are you sure the Richat Strcuture in africa is not an ancient Coronae volcano? Looks pretty similar, and fits the features and mechanisms of what you describe a Coronae almost perfectly. That looks very much like a corona, and reading the papers there is a lot of similarity in how it formed. It is much smaller than typical ones on venus, and the interior has had hydrothermal activity but that is minor. Coronae form from uplift from a mantle plume, but where the amount of material that actually erupts is small so tat it doesn’t cover the uplifted structure. In the eye of Africa, there has been excavation by erosion, which does not happen on Venus. So yes, I would happily use the term corona for this one. But noone else seems to have done so. Not the scar of an exit wound then…. The circles date back through geological history and so I just wondered if they might have been pushed up and away by an impact of something small, hard and fast enough. No worries – just my imagination! And that harks back to the Antipodal theories… Any suspects for an impactor at the antipode? Specifically one with enough energy to manifest itself as the Richat Strcuture? Remember, that Earth is not a perfect sphere, and the arrival of the various shock fronts would not be a clean simultaneous event. I can see converging shock fronts making an other wise normal volcanic event turn into an absolute mess, but making near perfect concentric rings? I’m skeptical. Thanks, Albert, for another great volcanic trip into space! (1) Earth and Venus are very alike save one notable difference; Venus has no satellite to compare with what is to all intents the Earth-Moon binary system. Could this have had any influence on its development? (2) The lack of plate tectonics from an apparently very similar planet is a mystery. Possible lines of investigation might be either the role and amount of radioactivity compared with earth, and the effect of a ‘dry’ system without the water and hydrated minerals to, as it were’ “lubricate” subduction. Perhaps the ‘tesserae’ are a response to attempted plate movement in the absence of subduction? (3) Hell’s Foundations: almost predicted by SF writer Hal Clement in his short story ‘Hot Planet’ published back in 1963. True, he set it on Mercury rather than Venus, and the heat source was presumed as a result of tidal flexing (cf Io!) rather than mantle heat, but he got the result pretty well nailed. Consider moons. Note that all (almost all?) bodies showing vulcanism have significant tidal effects either because they are moons or have moons. Earths moon is odd, perhaps because it has no core and was made fromm (cooled) reconstituted fragments. There has been a lot of discussion on why plate tectonics failed on Venus (and on Mars, for that matter). One suggestion was that the crust on Venus was thicker than on Earth, and was too thick to break. The earth may have an exceptionally thin crust, with most removed by the impact which formed the moon. That model is now less popular. A more recent model is that plate tectonics requires water; water lubricates the plates and changes the melting point to form magma. I see one other option. Plate tectonics is driven by mantle convection. Convection starts with cooling at the top. Plate tectonics provides the cooling. So there may be two stable solutions: one with plate tectonics and convection, and one with a stable crust and no mantle convection. Which one occurs may depend on chance and small effects (a bit like the butterfly steering hurricanes), or a planet may change from one mode to another. Venus may have had plate tectonics in the past, and Earth perhaps did not. You could even envisage situations where the extreme greenhouse effect stopped mantle convection, by reducing the cooling. Speculative. Tides have no direct effect on planets. They can heat moons very close to a much larger planet (like Io) but not to te other way around. The tidal force is really very weak. Our moon does slow down the earth and that is an extra energy source, but it is quite small compared to radioactive heating. Radio activity may be less in Venus but we don’t know that, and you would actually expect the opposite. Surface cooling derived from plate tectonics. Another factor not so far mentioned (throwing out ideas off the top of my head here -mind the dandruff!) is the effect of carbon-based life kicking off on Earth, extracting large amounts of carbon and fixing it either as hydrocarbons or (from the Cambrian on) as carbonate rocks -limestone. It is a system with two stable modes, one with mantle convection and one without. It is not uncommon in physics. Which mode a system ends up in depends on how it starts out, and it may suddenly change. Life will have changed the carbon cycle a lot. We don’t really now when it got started though. A long while back I was interested in the suggestion that the tidal fulcrum between the earth and moon lay some distance between the core and surface of the earth, and that contributed to maintaining heat and plasticity in the mantle, thus assisting mantle convection. I believe this has been long discredited, but it has always held appeal to me. I recall seeing somewhere that tidal heating of the Earth’s interior is 3.5 TW or so, almost 10% of the Earth’s 44.2 TW geothermal heat flux at the surface. Suggesting that tides are a non-negligible source of heating, responsible for a small but noticeable portion of the total geothermal heat reaching the surface. Radioactive decay produces about 30 TW. Since these sources, and much more minor sources such as chemical reactions and phase transitions, add to less than 44.2 TW, the Earth’s interior is slowly cooling, losing about 10^13 of its 10^31 joules of internal heat per second (or about one part in a quintillion — at that rate it would take 31 billion years for the Earth to cool to ambient, but the rate will actually drop as the temperature gradient decreases). The number I have is 2.5TW for tidal heating. That is an average for the past 500 million years (it varies a bit with height of the sea). Radioactivity contributes 28TW, and thermal contraction about 3TW. In total, the earth produces about 33TW. It loses 44TW: as you say, the difference means that the Earth is slowly cooling (and is why the core is solidifying: in another 2 billion years or so we should have a solid core). Tidal heating happens mainly in the oceans, so it heats the sea rather than the interior. If you compare this to Io, the tides will be 100 meter tall and the whole moon gets treated by Jupiter as if it is inside a food processor. Io suffers because of its elliptical orbit: it would have been fine on a circular orbit. Its volcanoes get their energy from this tidal kneeding, so these volcanoes depend on the elliptical orbit. Our moon ha a similar size to Io and also has an elliptical orbit, but the Earth is much smaller than Jupiter, so the tidal force on the Moon is very roughly 1000 times smaller. Speaking of tides. This paper goes into a discussion about periodic increases in tidal forcing that could be related to the Bond events. Even tidal heating of the oceans “counts”. It inhibits heat loss through the oceanic crust and out to space, somewhat like one of those warm-air curtains that stores in northern states often have just inside their doors that they switch on in winter to cut down on heat loss when customers enter and leave. It counts but it comes to only 5-10 mW/m2. Solar radiation gives on average 250 W/m2. Tidal heating won;t make much difference on the surface. Also, the surface cools quickly. Energy generated inside the solid earth has much more effect,first because it can’t get out easily so things warm nicely, and second because solar radiation doesn’t reach there. The solidification of the Earth’s core is estimated to have started 2 billion year ago, so at the start of of the proterozoic. But that is an estimate. There isa suggestion it changed the magnetic field, with the field from the inner core oriented along the equator rather than the poles.That again is rather speculative. There wouldn’t have been an immediate change. Once the whole core is solid, you can expect our magnetic field to disappear. It should be noted that there is an alternative theory that states that the high atmospheric temp is merely a function pressure due to the atmospheric thickness, with greenhouse forcing being non relevant. Obviously the formation of the earth/moon from a collision of two smaller planetoids is vastly different to that of venus, so rather than calling them sisters they are more like an example of convergent evolution, such as a shark and a dolphin. Yeah sisters is a bit of a stretch. If you take away the similar masses there isn’t much left. Venus is almost twice as close to it’s star, so 4x as much energy input, and no moon or planetoid impactor event. Even the gravity at only 10% difference may be quite significant. Venus is at 70% of our distance to the Sun, so the sun’s energy is twice as high, not four times. But the planet is much more reflective. Most sunlight is reflected by the clouds (which is why Venus is so bright in the sky). The net effect is that Venus gets less heating from the sun than we do, not more. Rob, the extreme temperature most definitely come from greenhouse – if you make its atmosphere from nitrogen while keeping the density the same, temperature would be much lower. Venus must have had a big impact during its formation, just like Earth: it is hard to see what else could have stopped it rotating. So yes, the planets are very alike. But totally different. Eh, you’re glossing over what is the cause of the cloud density in the first place? Likely all the energy its getting from its star. I am not sure what you mean. The thick atmosphere dates from when Venus formed. The Earth had a similar atmosphere at the time – can’t blame the sun! The two planets still have a similar amount of nitrogen, which is mostly inert. Also remember that when the planets formed, the sun was 30% fainter than it is now. I think this thread lacks Hekla discussion. Even if small, the frequency of smallish quakes happening right on top of Hekla has been rising, definitely showing what seems to be some strain built up. Fascinating article Albert, extremely well written, you have the skills for sure! Thank you Ian for this next “installment” in the time series. Visual representations like this are definitely more informative and revealing in ways a simple table of data cannot represent. Great map! 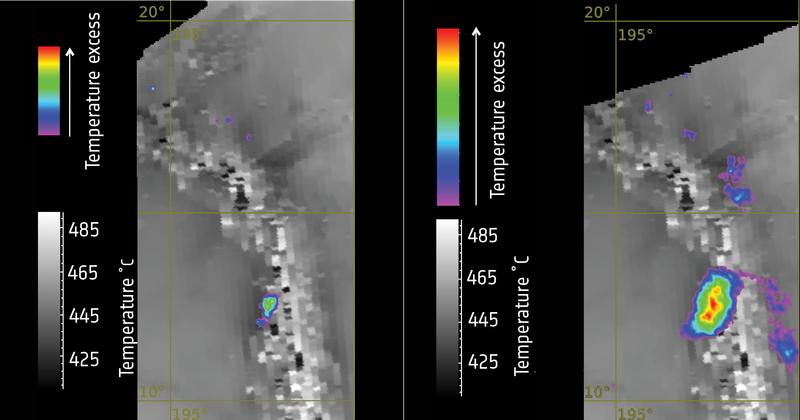 Really fun the zoom to the Bardarbunga region and watch the sequence! There was quite some action in the ‘elbow’ east of the caldera prior to the Holuhraun event. Great, 😀 \o/ please go on messing! Also when watching the eruption August/September 2014, watch it light up. Really a great job! 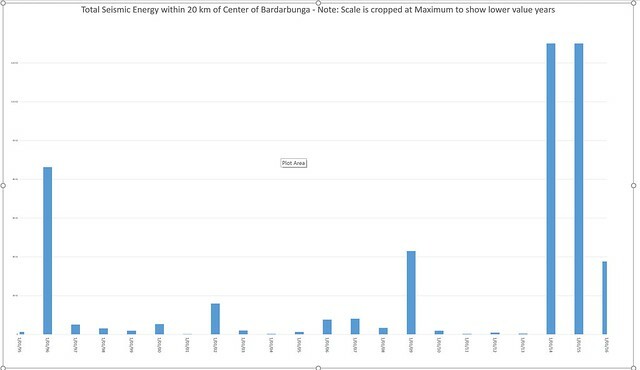 Would I be wrong in thinking that there is more deep earthquake activity across the eastern Iceland volcanic regions than there was before Bardarbunga’s eruption, or really at any other time that we presently know of? I may be way off here, I’m sure there is some data out there to validate whether this is or isn’t true, but it seems like every day, there are deep quakes either in Vatnajokull, Askja, or under Mýrdalsjökull. Compared to the start of the time series in 1995, there is an increase. Now, if it’s an actual increase, or if it is just an effect of better instrumentation is impossible for me to say. I would guess most of it is due to better instrumentation. However, the early data 1995 to 2000 is made up of mainly quakes M1.5+, this improves in 2000 with the addition of the Grims station and again in 2003 with further additions. There are smaller quakes detected. This has now improved with the addition of the KISA station. The depth of the smaller BB quakes is much more accurate and deeper, on average quite a bit deeper. This implies much of the data over the years should also have read deeper. I also think your observations may be correct regarding before and after the eruption, the areas of quake activity changes dramatically. The Kitsufell and Kverkfjöll areas went dead silent and the area to the NE of BB as well. The main activity now is in the center of the caldera and deep. Very interesting read! Thanks!! It would be interesting to know more about the chemical composition of the interior. Iron core, its size etc. Well, the density of Venus is fractionally higher than that of the Earth, by 2% or so. That suggests its iron core is fractionally larger than ours (relative to the size of the planet). Overall, no real difference to us. Something appears to be happening near Krisuvik (kri)? A very sudden spike at all frequencies. Nearby SIL’s also showing elevated tremor levels. 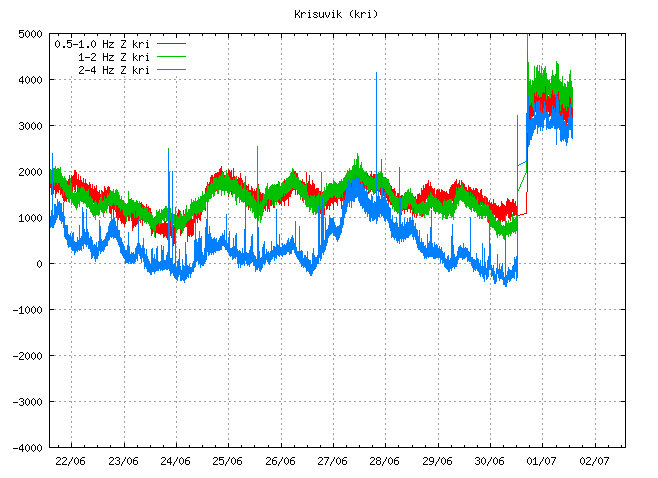 And a hydrothermal signal around Hamarinn again, HUS tremor increased, GRF and VOT are sadly offline. magnetic flied-probably due to the lack of rotation? Yes, probably due to the lack of rotation. We don’t know whether Venus every had a strong magnetic field. The surface is too hot to keep its original magnetization so we have no record of the past. Magnetic fields of planets form in a rotating conducting fluid. On Earth that is the outer core, on Neptune it is a mantle ocean. Venus should have a liquid core, but rotation may just be too slow. Be it noted that Sakurajima has now gone a month without a single eruption. That’s… unusual. And the last period of significant activity was in mid-May. Would be interesting to find out what’s going on. Interrupted magma supply? Blocked conduit and pressurizing? Magma gone elsewhere? Either way interesting to see what happens next. INSAR & tilt/GPS & COSPEC data might be illuminating. And of course as soon as I post this it reports a single explosion – size unknown! Looks like the elevated tremor at Kri was a telemetry glitch. Plot looking a lot more normal now. That really looks like extremely fine ash coming through the glacier. With that said, the webicorders and quake charts aren’t really showing anything, so I can’t imagine this would be what it really looks like. With that said, when you see dark clouds seeming to come out of a glacier in the midst of extremely light clouds, it does make you wonder. Probably nothing, but if that’s the case, that is the most deceiving I’ve ever seen a webcam behave in terms of something that possibly looks like an eruption cloud. What if earth was larger? If Earth was larger it would generate more internal heat …a larger earth would be more geologically active. If earth was larger we would have more internal heating..More heat from compression as the planet formed, and more radioactive elements trapped deeper. and a larger planet retains its internal heat more. -many plates, rifts, ranges and volcanoes; possibly so hot inside that its plates are more elastic than Earth’s. Yes, that is possible. Of course in the past our own mantle was hotter and the idea is that plates in those days were smaller. Nowadays, the hottest mantle is probably around Vanatua and plates there seem quite fragmented. Gone, sadly… But what heroes!